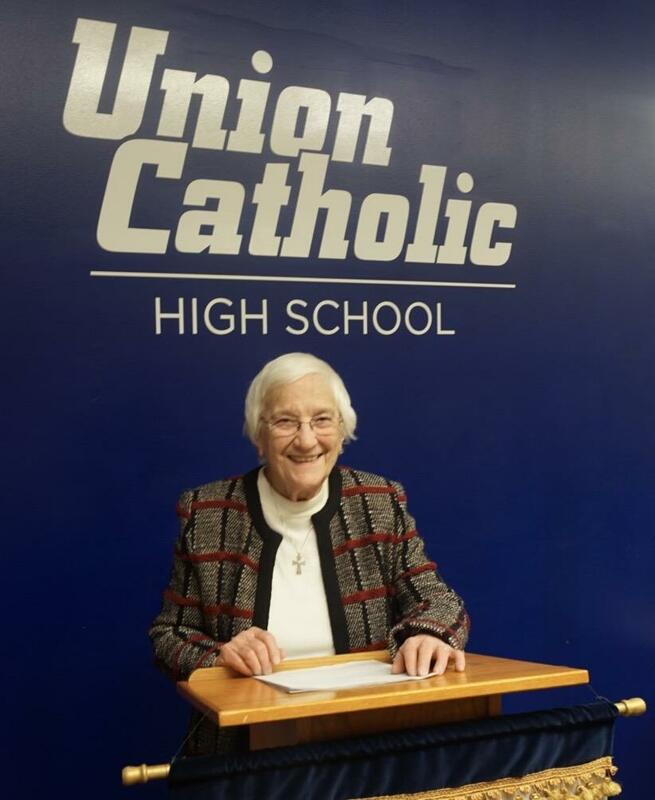 Union Catholic Principal Sister Percylee Hart, RSM, delivered a very inspiring, informative, and enlightening State of the School Address on Thursday morning, which featured powerful video clips from administrators, faculty members and students, who provided highlights from this school year. Science classes have skyped with scientists around the world to better understand the type of work that takes place in laboratories. UC students benefited from the opportunity to explore STEM careers in the Biotech industry at the Young Women in Bio Event hosted at Celgene Corporation in Summit, NJ. In alliance with Fairleigh Dickinson University and Saint Thomas Aquinas College, UC offers students the opportunity to earn dual credit in 13 AP courses as well as in senior Honors English. Students earn high school credit, while also earning transferable credit to the college of their choice. Our students have the opportunity to complete a year of college at UC by earning as many as 12-15 credits. UC students are able to select from over 200 online courses of interest through our relationship with The Virtual High School Collaborative. UC’s social justice initiative continues to flourish as students prepared 35 Thanksgiving . food baskets, filled 50 backpacks with school supplies. UC hosted the first-ever Shining Stars Network Christmas Show that showcased special needs individuals and their high school “buddies.” UC’s student-run CRAYON Club partnered with Shining Stars to produce a memorable night of musical fun. UC began a new Success Leadership Program that connects specially selected upperclassmen, Success Leaders, with UC Freshman Foundation students. Success Leaders provide mentoring on topics such as time management, test preparation, stress minimization and self-advocacy. Students for Human Dignity spread Christmas cheer during a day of service at St. Joseph Social Services in Elizabeth, distributing grocery items and Christmas to approximately 300 families. The new Village English Literacy Club is collecting books to send to villages in China to promote reading in the English language. The CRAYON Club has hosted several fun activities for special needs teens, including a sports day in the courtyard; movie night with snacks and games; and a holiday party. The Student Movement Against Cancer worked the December blood drive and supported the Emmanuel Cancer Foundation’s Wish Grantor program. The Fall Legacy Breakfast, hosted by the Alumni Relations Office, celebrated the 36 UC families. Over 250 people attended the Grandparents Breakfast before the Thanksgiving Liturgy. The UC Performing Arts Company’s Cabaret Night combined the awesome talents of today’s UCPAC with those of performers and stage crew members from past UC productions. The College Alumni Panel, consisting of recent UC graduates, shared informative perspectives on college with the senior class. UC’s Parent Council hosted an outstanding Pub Night in November and is working hard to make the March 22 Tricky Tray the best yet. So far this school year, varsity sports teams have a combined record of 72 wins, 55 losses, and earned state sectional titles along with multiple county and conference championships. Girls Volleyball – Conference, Union County and State Sectional Champions. Boys Basketball – Paterson Charter School Christmas Tournament champs. UC’s Livestream continues to be a great asset as it streams and archives all home athletic events as well as concerts, awards presentations and graduation. Several students achieved perfect test scores on the math portion of the SAT and the writing, English and reading sections of the ACT. UC students participated in Union County’s Student Training Enrichment Program where activities focus on leadership, personal growth and civic engagement.